Guess I'm missing something but I think it would be a good idea and the added weight would go un-noticed. In 50 years of backpacking I have never used one. It is hard for the manufacturers to keep up with all the tents, much less added vestibules. It would be a good idea to use one under a tarp. Take your boots off before crawling into your tent, and you will have no trouble keeping it clean. Xeno, you could always make your own to include the vestibule. I have done that. But in wet weather the moister that you bring in sits on top of the foot print making a bigger mess. I make my own footprints out of 4 mil plastic from the local home supply store. Mine include vestibules. It is hard for the manufacturers to keep up with all the tents, much less added vestibules. I think the OP was asking why the footprints that come with a tent don't cover the ground under the vestibules as well as the tent body itself. I always use the vestibules as a place to keep my muddy boots and/or wet gear. That keeps them out of the tent, but still leaves them sheltered. It also lest water drain off of wet clothing or boots, and allows a bit better ventilation to help in the process. Beside, the fly on my 5-lb tent weighs an extra pound all by itself - if it reached under the vestibules it would weigh at least one and a half times more. 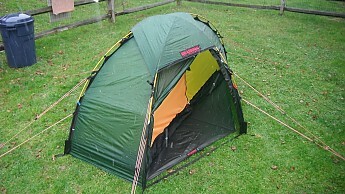 So I went and bought another footprint that match another tent but suite the long dimension that I was looking for. It put one grommet in it at the vestible stake and there I was with tent with its' own footprint and a super light tarp (footprint for ground cover at the tent entrance. It has worked great at the initial staging mat, entry roll in/out point and pack up mat. Plus gives me that covered ground area under the vestibule. Best thing is if I don't' want it and want to go light I leave it behind. Thanks for the input. I always brush myself off and remove my boots and socks before entering my tent; just thought I'd ask. Thanks again for the info. The 4mil plastic drop cloth is a good idea. Put the material on the ground, set up the the tent on top of it and mark about 1" in from the sides of the tent - all the way around. You don't want water funneled in between the tent and your footprint. 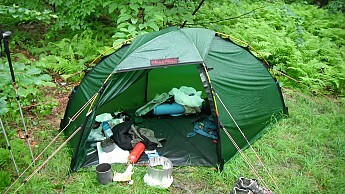 The use of the foot print is for damage control and added abrasion resistance to the floor of the tent. Doesn't have to be water proof - the tent bottom does, of course. The foot print can have holes in it so long as they are not where your body or knees put pressure on the floor. If you make the footprint out of inexpensive and lightweight material, when the holes make more area than the material, toss it and make a replacement. You can cut a heavier weight piece for the entry way and storage area if you think it is needed. But dirt is dirt. Just keep it outside if you can. I am, pretty adamant about using a footprint. Especially with my Copper Spur 1 being the material for the floor is really light weight stuff. If nothing else it saves a bit of wear & tear on your tent floor. It's alot easier on the wallet to replace the footprint than it is to replace a tent floor or the whole tent. I have a Copper Spur 2 and love it! I purchased the matching footprint to protect the light weight fabric, which is what planted the seed about the vestibule.